CDR Salamander: Now THATS the Navy I Like to See! Now and then you see a little thing that happened and think, "I wish I were involved with that." Well, that happened a few days ago, and BZ to everyone involved. In its own way, this harkens back to a great tradition in our Navy of chasing records and doing things because they are hard, can demonstrate a capability, and yes ... fun. Two U.S. Navy Mark VI patrol boats assigned to the Coastal Riverine Group (CRG) 1 Detachment (Det.) Guam, completed the longest-ever small patrol boat transit. The two boats completed the 500-nautical-mile transit in just two days. 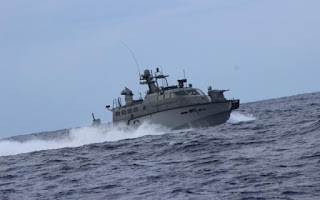 The objective of the mission was to test and evaluate the operational reach of the patrol craft. Special attention was given to how much fuel the patrol boat was consuming at different speeds, how it handled the different weather conditions, and how the crew was affected by the long transit. Overall, the patrols boats cruised at an average speed of 25 knots around (around 30 miles per hour). The Mark VI is powered by two diesel MTU 16V2000 M94 and two waterjet Hamilton HM651 engines. With a length of 85 feet, the boat has a crew of five and can carry up to 16 fully-loaded troops. Regarding armament, the Mark VI is armed with an assortment of Mark 50 and Mark 38 chain-cannons and Mark 44 machine guns. I don't know why this isn't getting more press, but we'll cover it here. Does this make China concerned? No, not really. Does it provide a valuable benchmark for this platform? Yes. Does it make me want more smaller ships for JOs to cruise the world around to build not just presence but also experience? It is a good to see proven platforms doing exceptional things in a sea of bad press?